~ Ron Cobb, Alien portfolio. 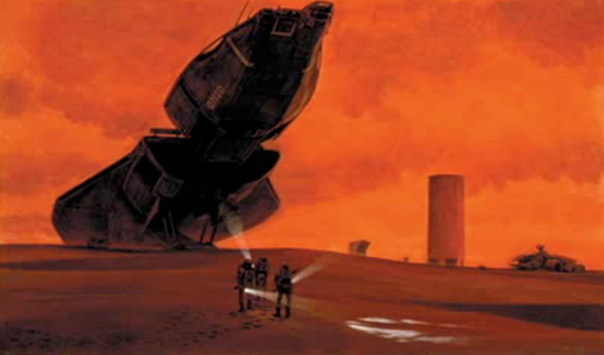 In Dan O’Bannon’s original screenplay the alien planet was dotted with two objects of note: the SOS-emitting derelict vessel, and an alien pyramid. Inside the derelict the exploring crewmen find the ossified remains of the Space Jockey, and in the pyramid they stumble upon the Alien spore. “The pyramid and derelict -two different elements- were still the subject of a see-saw debate when I came on the project,” Ridley Scott is quoted as saying in The Book of Alien. “I would love to have shot [the pyramid], but the more I thought about it, the more I realized it would have been wonderful in a three-hour version. What finally cracked it was the budget. We just had to get rid of it.” In the film, these two different structures are merged into one, becoming a “surrealist mystery”, in the words of O’Bannon. In the original script the Jockey was merely a planetary explorer, and his ship a research vessel of sorts, and not a carrier of biological warfare as suggested in the movie. The Jockey and the Alien were two completely unrelated alien species, with the former simply serving to forewarn the audience, and the Snark crewmen, that something deadly was lying in wait—a warning that the human explorers ignore to their peril. O’Bannon’s original conception of the Alien race was not that of a deadly bioweapon. Instead they were an ancient, cultured, yet annihilated race. “The planetoid was now dead,” O’Bannon explained, “and this civilisation had been gone for millions of years.” This “unique race” sported a strange, apparently religion-based reproductive system that necessitated three sexual partners—two consensual, one sacrificial. The reproductive process was undertaken within pyramid structures. Kane explores the innards of the pyramid. Light beams down from an oculus. His torchlight finds a hieroglyphic explaining the Alien life-cycle. Though O’Bannon’s idea of a bygone, ancient Alien race was nixed by this merger, it did lend the Space Jockey a more sinister undertone. No longer an innocent victim of its own curiosity, the Jockey was depicted as a creature that had seemingly fallen foul of its own dangerous cargo. The Jockeys would no longer be merely a “space-going race,” but were hinted to be interstellar warmongers, with the Alien their apparent weapon of choice. “They’re probably scattered out on this plain,” Lambert interjects. The Nostromo crew find the ‘Cylinder’, a man-made construct that houses the alien spore. As it turns out, the spore is in fact not alien, but instead is a biological weapon created by the Company. The crew have stumbled on a research facility, and are now its new test subjects, with all the slaughter to be observed and reported by Ash. 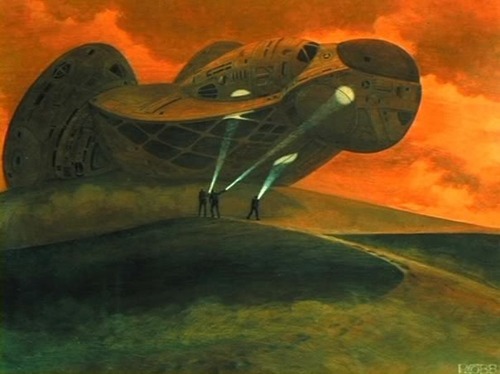 The Cylinder survives only in one piece of Ron Cobb’s conceptual art, which shows the short-lived construct looming behind the derelict “L-52”. In this version of the story, the Alien is a bioweapon engineered by the malevolent Company. The Nostromo crew are re-routed to be used as specimens to test the creature’s lethality. When Ron Shusett presented his and O’Bannon’s original script to the newly recruited Ridley Scott, Scott decided that they should go back to the original plan. Though the alien elements would go on to persist all the way to the final movie, the separate pyramid/silo, ultimately, would not. After the script had been (pretty much) locked down and the concepts agreed upon, and with the egg silo finally merged with the alien ship, it was time to settle on a design for the vessel. For this task, Alien conceptual artists Ron Cobb, Chris Foss, and Jean ‘Moebius’ Giraud initially took turns at the design. ~ Dan O’Bannon, Cinefex, 1979. Moebius’ steampunk conch design appeared in one set of Ridleygrams. 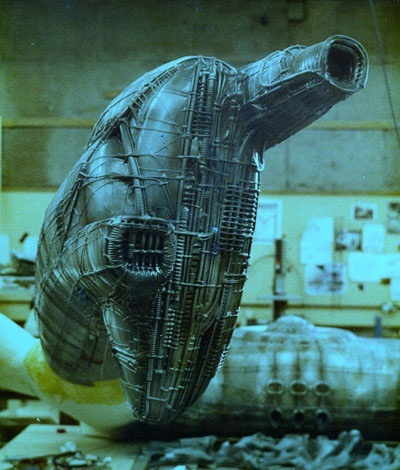 Scott eventually turned to Giger, fresh from designing the Alien, for other interpretations of the Jockey ship. The grounded derelict. Image copyright HR Giger. 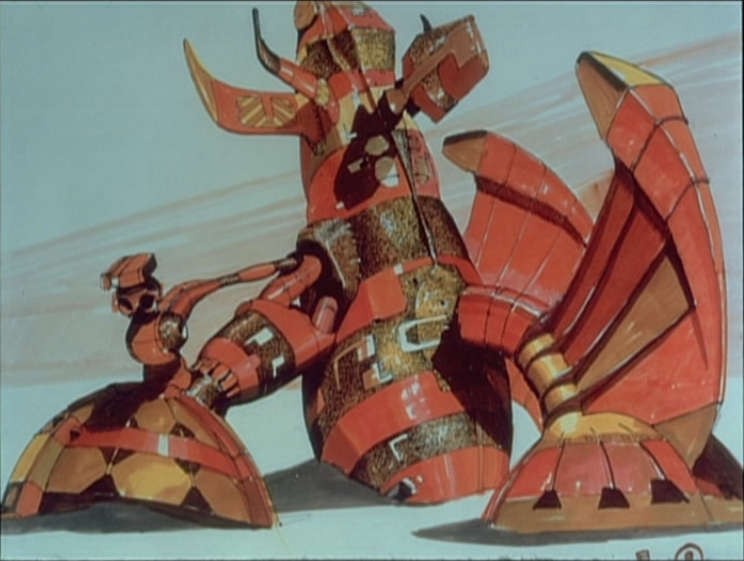 However, despite Ridley loving the design, some members of the production crew took issue with the derelict’s odd shape. First to object was the film’s writer. “O’Bannon,” Giger wrote in his diary, “who has just flown in from the USA, doesn’t think it’s technical enough. A battle of pros and cons begins. I keep my silence; I know that Scott will win the argument.” Of course, as it turns out, he did. …and made it a surreal biomechanic reality. Giger’s concept for the derelict’s interior corridors. The design is akin to a long, wormy sternum threading its way through the ship. The ship’s ‘ribcaged’ interior set. The walls glisten and drip like the innards of a great carcass. As already established, to be more economic (in terms of time and money) the egg silo was merged with the derelict. Literally. The Jockey pilot room set was redressed and was shot as the egg chamber. For the hold, O’Bannon raised an objection. “[O’Bannon] once said,” Giger explained, “that the hatchery could not contain more than six eggs. And I had to convince him that a hatchery with six eggs was preposterous.” Over-ruled, the production built literally hundreds of hollow eggs for the silo set. Kane’s venture into the silo would be shot in September 1978, and the close-ups of the egg and the erupting facehugger were shot later, at Bray studios, along with the shots of the Nostromo. “I had a company called Holoco,” Furst explained in 1989, “and we did a holography show at the Royal Academy [in London] called Light Fantastic, which was a success that none of us expected. As a result of which, The Who, who backed the show, bought a quarter of Shepperton Studios and set up a company with the money. Just at that time, there was this plethora of FX films, and we had all this laser equipment, so we were doing laser effects, and we then brought in model units, and we worked for four years. At one point, we were working on Outland, Flash Gordon, Alien and Moonraker all at the same time. We had crews all over. I was running a whole operation. I wasn’t near a drawing board; I was just trying to keep the crews working.” Furst, tragically, took his own life in 1991. The purpose of the derelict craft is left a mystery in the film. “I was amazed that no one asked me about this mysterious element of the film,” Scott said to French magazine L’Ecran Fantastique in 2012, “but if you would have asked me in 1978, I would have gladly explained that, in my mind, all this alien ship could be was a battleship.” Aliens writer/director James Cameron explained that the derelict’s purpose and story was something best left to the original director. 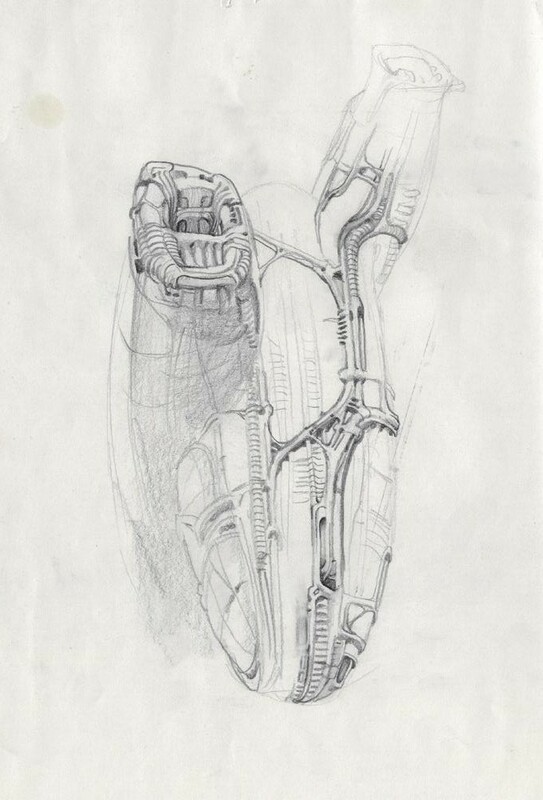 Cameron’s sketch of one of the derelict’s prongs. We can see some resemblance to a heart. Though we never saw its interior, the original derelict made one last appearance in the series in the Special Edition of Aliens, where the Jorden family find the ship; torn from its perch by seismic activity and cleaved in two. For its scenes here, plates of the original ship were filmed in the US. The actual model had fallen into disrepair during its years in storage, and its battered appearance was unaltered for the film. 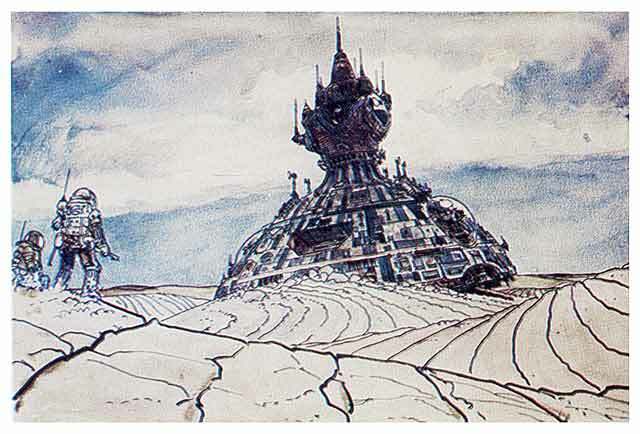 Planetary concept art by Ron Cobb. 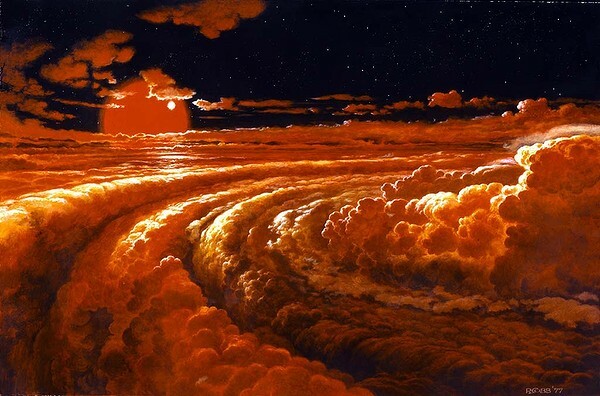 A red giant and white dwarf illuminate the roiling, ruddy clouds. The Snark stranded in a dust storm. 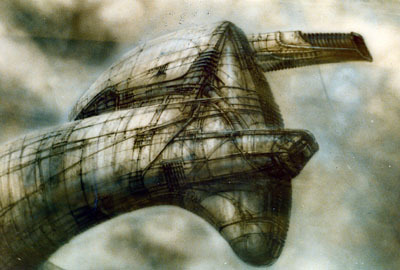 The planetoid in the film is essentially as described in the script, but none of the concept art, bar Giger’s, presented it as the grey gloom evoked by O’Bannon. 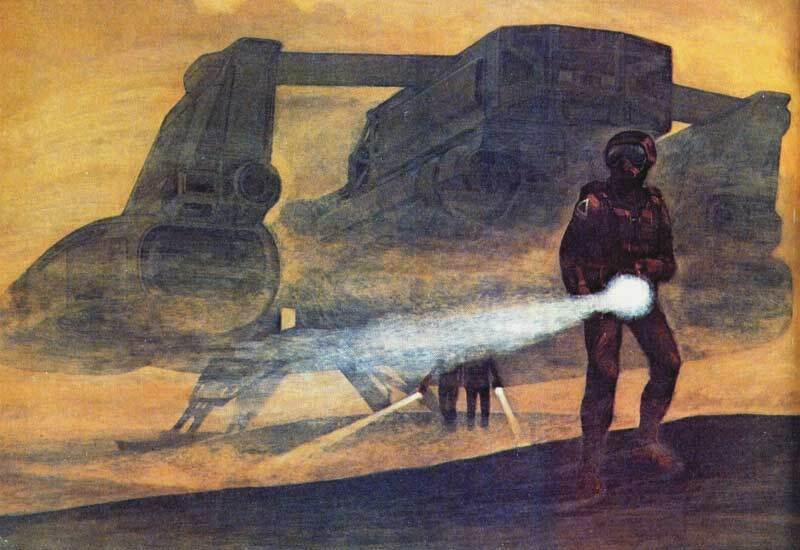 Instead, preliminary artwork by Ron Cobb, Chris Foss, and even Moebius showed a Mars-like wasteland. In fact, in the original screenplay there were traces of a bygone alien race on the planetoid’s surface – the most notable element being the famous spore pyramid. The characters deduce that the pyramid is a “a pre-technological construction. That slab was engineered by an Iron Age culture at best.” The structure once served as a breeding temple for the planetoid’s primitive beings, who required three sexes to reproduce: two consensual, and one sacrificial – an incubator to carry the seed. The pyramid would find itself excised in the first rewrites conducted by Walter Hill and David Giler. “We believed,” Hill explained to Film International in 2004, “that if you got rid of a lot of the junk -they had pyramids and hieroglyphics in the planetoid, a lot of Von Daniken crap- that what you would have left would be a very good, very primal space story.” However, Hill and Giler did not merely remove the pyramids and hieroglyphics, but they replaced them as well. For one iteration of the script, the Alien spore was housed in a man-made construct known only as the ‘Cylinder’. One piece of Cobb’s art shows the short-lived Cylinder construct. In this version of the story, the Alien is a bioweapon engineered by the malevolent Company. The Nostromo crew are re-routed to be used as specimens to test the creature’s lethality. The Lovecraftian tones infused into the script by O’Bannon were utterly removed. When Ron Shusett presented the original script to Ridley Scott, Scott decided that they should go back to the original plan. 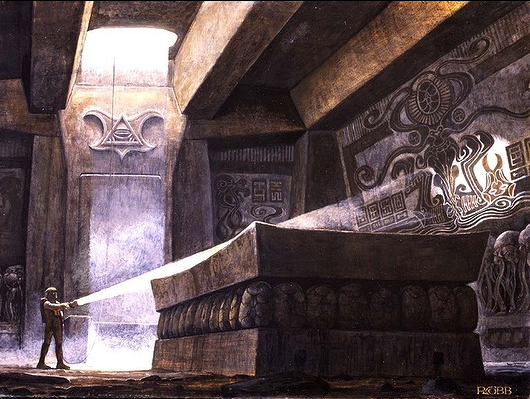 Though the Lovecraftian tones would persist all the way to the final movie, the pyramid, ultimately, would not. At first, Scott flirted with the idea of shooting on location, but due to financial and logistical impracticalities, the dream was short-lived. “Studio landscape is bloody difficult,” he complained. “You’re constantly staring at plaster rocks and saying, ‘Christ, this doesn’t look right.’ I would have preferred to do some of it on location and then do a studio link. In fact, I‘d been looking at some spots for another picture that would have been beautiful for Alien, particularly in Turkey where there are these pyramid-like dwellings – huge mountainous structures which cover hundreds of square miles. Absolutely extraordinary. 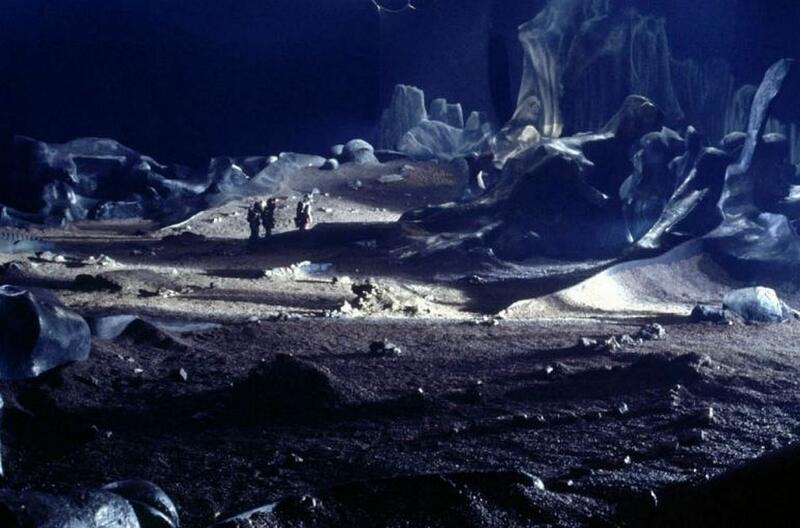 But it was a practical budget decision not to go away on location, and so we just did what we could in the studio.” Scott would eventually get outside for the LV-223 landscape in Prometheus. Twisted biomechanical landscape. Image copyright HR Giger. The expansive sets were shrouded in smoke and dust to simulate storms and to hide the physical limitations of filming on a stage. 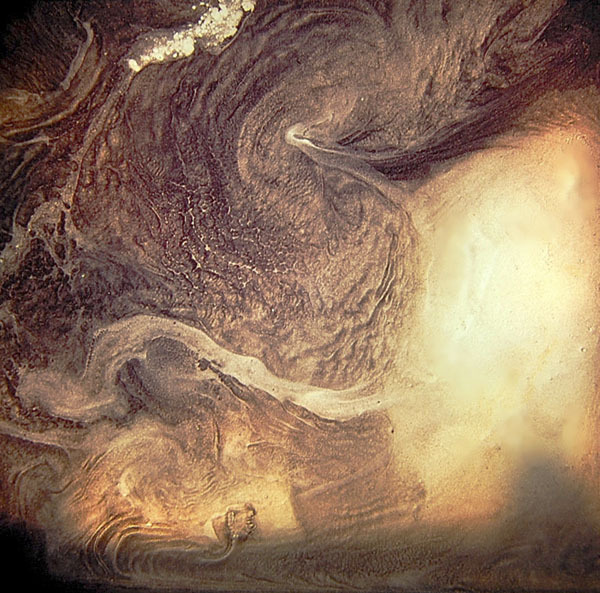 Surface of the planet from orbit.